"Sad?" says one who has watched this once-proud franchise fall into disrepair, the tragic victim of neglect and poor planning. "It's not sad. It used to be sad. Nobody cares enough to be sad anymore." Other NHL franchises are poorly run. But for consistently gruesome seasons, the Chicago Blackhawks are a tough act to follow. 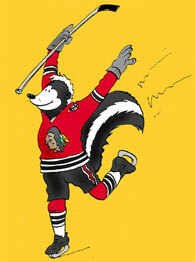 Yes, the Original Six Chicago Blackhawks. The Hawks of Bobby Hull, Stan Mikita, Glenn Hall, Pierre Pilote, Keith Magnusson, Iron Mike, Eddie the Eagle, Denis Savard, Doug Wilson, Chris Chelios.